It’s been a while since I’ve knit any sort of sweater or cardigan, and it’s definitely been a while since I made one with pink (the Marled Knit Cardigan). That’s why today I’m thrilled to share this simple pattern that I’ve been putting together! It’s seriously the softest cardigan I’ve ever made (thanks to the buttery soft yarn). A soft, pink, fluffy sweater calls for the name “Cotton Candy” Easy Cardigan, right? While it’s fleecy and wonderful for winter, this sweater’s airy and light enough to take you into spring as well. 🙂 It’s a perfect project for those of you who want to make a sweater for the first time. The pattern is quick and easy, so you shouldn’t find yourself halfway through, feeling overwhelmed and unmotivated to finish. And if you haven’t yet learned to knit, you can find my tutorial on how to knit HERE and how to purl HERE. These are the only stitches that you need to master before making this sweater. Simple, right? The stitch definition turned out so cool, don’t you think? Using the large needles with this yarn created a soft, drapey piece with that super trendy, big-stitch look. The ribbing on the sleeve cuffs is particularly fun in my opinion. Above: I highly recommend this Feels Like Butta yarn (here) for anything that you want to be super, duper soft. Baby blankets, afghans and sweaters come to mind. If you follow my blog, you know my family loves nature. I find a lot of inspiration from the outdoors and this pink is no exception! While it’s a step away from my comfort zone of “au natural” neutrals, I love the pinks that we find outside. The first thing that comes to mind are the gorgeous sunsets that you can catch from time to time. When visiting Arizona, I’m always stunned at the pink and gold sunsets. 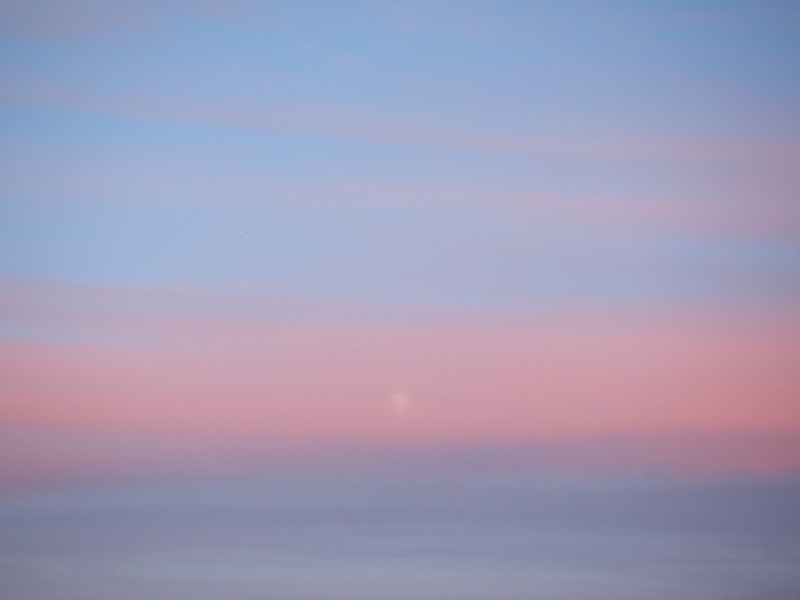 Occasionally, we have some fabulous sunrises with pink throughout the sky here in Colorado as well. This is one of those times where I wish you could reach through the screen and touch THIS CARDIGAN! I’d describe the yarn used here as a super soft, fleecy wonder. The best part is that it doesn’t shed either, which I find to be rare with some of the soft yarns. When I’m wearing sweaters and cardigans, one of the most important things to me is comfort. I basically live in cardigans all winter as they are the perfect layering piece. Sweaters are a little more restrictive as I like the open front for breath-ability with cardigans. 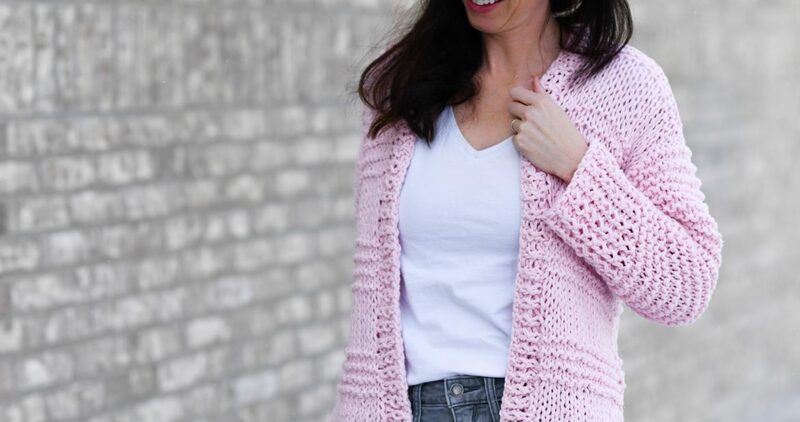 This Cotton Candy Cardigan is knit by creating a back panel and two front panels. You will also knit two sleeves (it’s not scary), and then pick up stitches to make the collar (also not scary). It’s also super easy to adjust the length of the cardigan by simply knitting more rows than indicated for each panel. As long as they all match, you’re good to go! 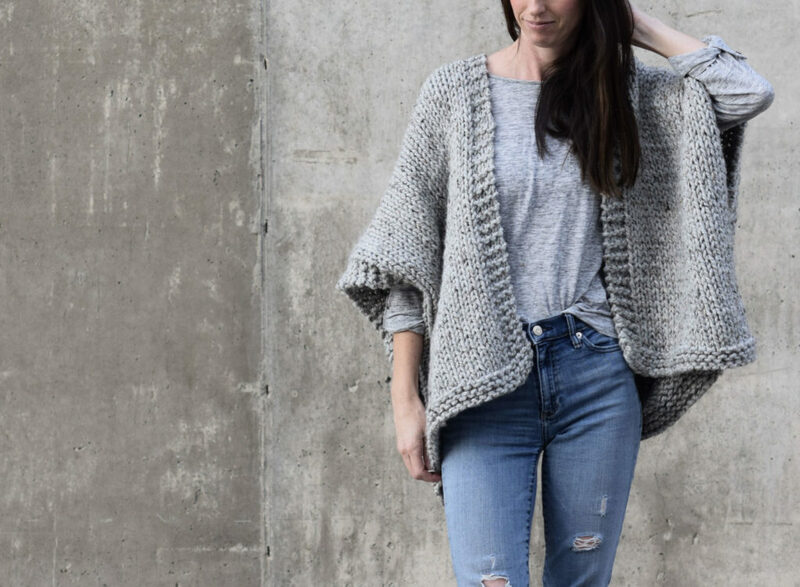 This cardigan is fairly short as the pattern’s written, so definitely feel free to add length if you like a longer look. It’s certainly a unique yet basic cardigan and it can be dressed up or down. Ready to start this fun cardi? Here we go! 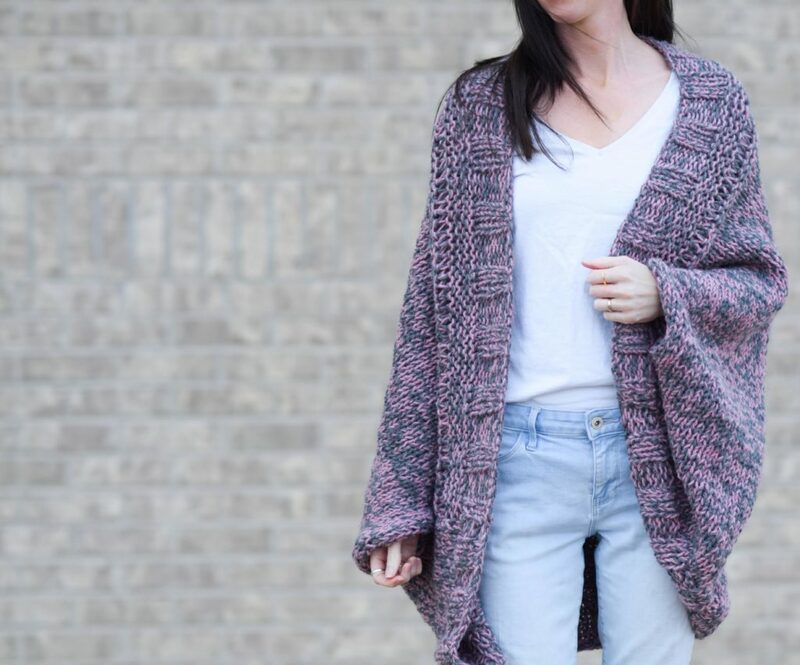 The look and feel of this superbly soft, airy cardigan will remind you of cotton candy! It features a comfortable, loose knit fabric with simple stockinette and garter stitches. The stitch definition is gorgeous and it works up quickly with large knitting needles. Because it’s made with minimal shaping and only requires beginner knitting skills, this is the perfect project for first-time sweater makers. This cardigan is made while holding two strands of yarn together throughout the pattern. You will be knitting a back panel, two front panels and two sleeves. All pieces of the cardigan are knit flat. These are each sewed and seamed to finish. If you’re experienced and would like to knit the sleeves in the round to avoid sewing and seaming, you may do so. The collar is created by picking up stitches along the inside edges of the front panels and back neck area of back panel. Use the mattress stitch seam for stockinette sections, a simple whip stitch seam for garter stitch sections, or your preferred seaming method. 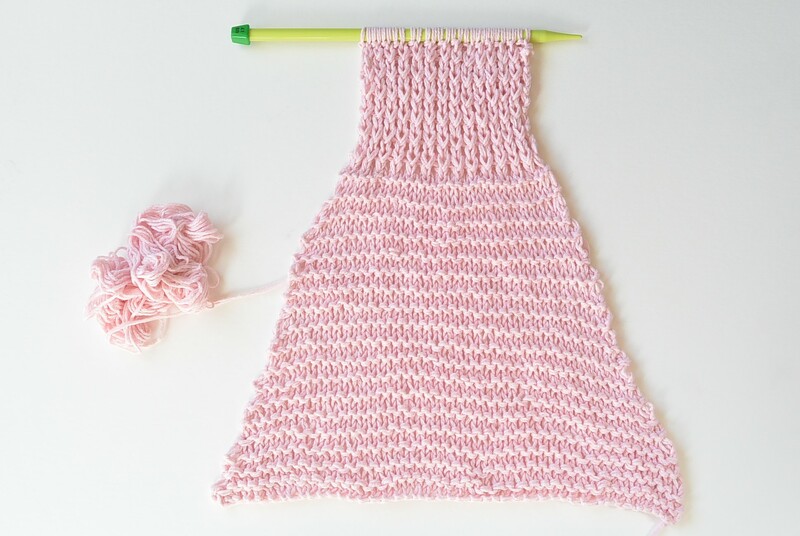 Next you will create the arm opening section, continuing from where you are in the pattern repeat from rows 1 – 14. Continue to follow the stitch pattern until piece measures approximately (20”, 22”, 24”, 26”, 26”) *Tip: If you’re a beginner, you might want your last rows to be worked in garter stitch as you may find it easier to seam at the shoulders. Simply work garter stitch for the last few rows no matter where you are in the stitch pattern. If you modify in this way, be sure to do the same to both of the front panels so they match. Repeat rows 1 – 14, in that order until piece measures approximately (12”, 14”, 14.5”, 15.5”, 15.5”) Just as with the Back Panel, you do not need to finish the 1 – 14 repeat; simply end on any row of the pattern when you reach the indicated length, matching the back panel. Next you will create the arm opening shaping section, continuing from where you are in the pattern repeat from rows 1 – 14. The length and stitch patterns should match the back panel. Using your tapestry needle and a length of yarn, sew front panels to back panels with mattress stitch seam on stockinette sections, a simple whip stitch seam or preferred method on garter stitch sections. Seam at the shoulders as well. Leave arm openings for the sleeves. 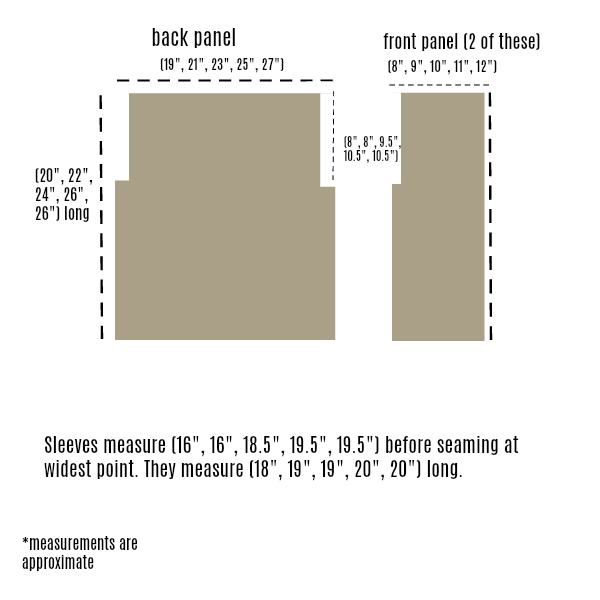 Fold and seam each sleeve, then sew sleeves to arm openings with preferred seaming method. For the collar, you will pick up stitches evenly along entire length and knit a 1 x 1 rib pattern. Pick up (60, 66, 72, 78, 84) along first front panel, pick up 12 (all sizes) along neck area on back panel, continue and pick up another (60, 66, 72, 78, 84) stitches along second front panel. That’s all there is to it, my friends! Have a wonderful day and I’d love to hear if you make one. Also, I’d love your feedback about me using this color. Would you like to see more color on the blog? I’m not making any promises as a neutral addict (hehe! ), but I always value your thoughts and opinions. Thank you so much! Thank you for sharing such a beautiful cardigan. I am loving the pink! May I please ask what size you have pictured? Thank you again. So glad you like the pink! I’m wearing the XS size and am 5’5” and 105 lbs. I’m also wearing a high waisted pant. Stay warm in PA and happy knitting! I am also enjoying the snowstorms in Newfoundland, PA, by knitting this in grey and purple. Warm sun put a nice glaze on the ice and it’s funny/sad watching my dogs fall all over the place! Love all of your knit patterns, I just don’t know how to use circular needles. Would love some help with this. Hi Lynn! You use circulars in this case only because straights might not hold all of this stitches comfortably for you. However, they might if you’re making a small size! You should google knitting flat with circular needles – it’s really no different than knitting with straights. Hope this helps! Love that you are starting to use colors, Jessica. Hi Wendy! So cool to hear from you. I remember that you’ve always appreciated the colors when I use them (rarely!). Thanks so much for still stick’n with me all this time! I love this beauty. But I don’t knit at all, only crochet, and want to stay with the one hook in all its forms, i.e. ordinary crochet, tunisian, and … knooking, which I’m keen to learn. So my question is, can we knook this cardigan? 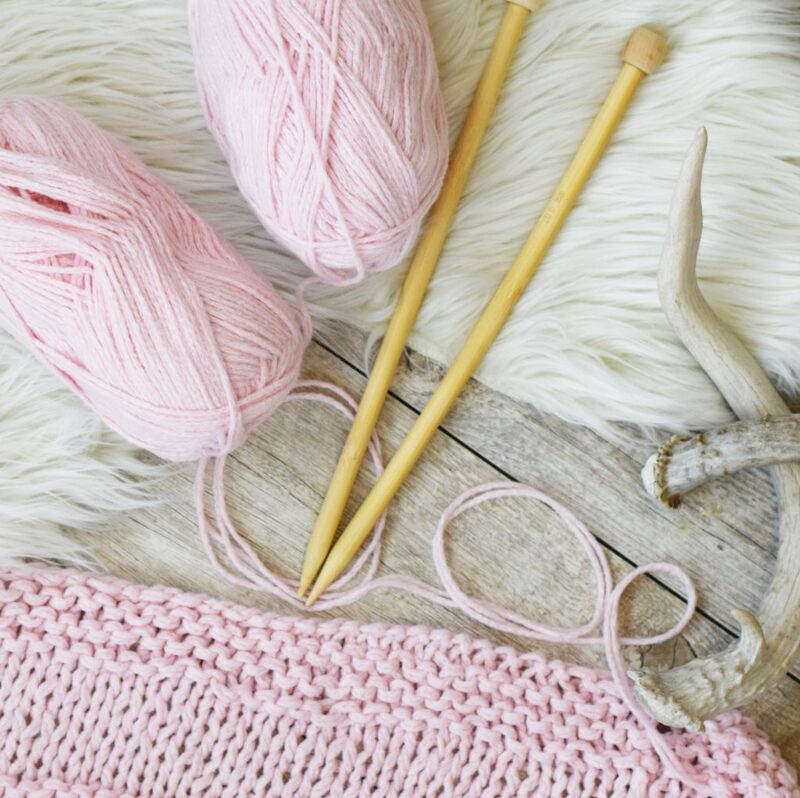 I’m a total igno when it comes to knitting, but plan to get to grips with it through the knook, and this looks like a wonderful project to start on (after I have a few simple dishcloths & potholders under my belt). I’m solid mid-level Intermediate as a crocheter, so how realistic is this idea? Either way, thanks for the lovely pattern! Hi Harper! I’ve never knooked and am kind of embarrassed to say that I know nothing about it! So I’m not sure if you can do it with this cardigan. What a pretty shade of pink! I made one of my daughters a cardigan out of this yarn for her birthday last year and it’s so soft! Another great pattern! Lucky daughter of yours, Christina! Is it possible that you will offer a video tutorial for this cute sweater? I love all of your tutorials and have made all of them. I absolutely love this! And the pink is absolutely perfect. Question: I am a 2x is there any suggestions as to how to make this a bit bigger? The arm holes sound a little intimidating for a beginner. Ahhh. All you do is cast off a few stitches at the beginning of the row and a few at the end. It’s super easy! I love this cardigan so much! My only question is, can the sleeves be knit so that the rows are vertical rather than horizontal for those of us who already feel self-conscious about our fat arms? I think the easiest would be that you could choose to modify and knit them in stockinette stitch instead. Follow the pattern but alternate a row of knit with a row of purl. Seam with the mattress stitch seam. I love this pattern and the color! I’m adding this to my ever growing list of things to knit! Hi, I love this cardigan so much. Any suggestions for substitute yarn? I am pretty sure I won’t be able to find Feels Like Butta in Canada. We’re having the same problem here in Sweden. If you google “substituting yarns”, you’ll find sites offering info on substitute yarns. Hope this helps. I’ve made several of Jessica’s patterns in other than LB yarns. I’m very pleased with the results. Of course I’d love to be able to buy the kits, but I’ve made finding a suitable yarn part of the fun. I love how creative you are, and I really like this cardigan. I wonder, being a larger lady, would I be able to knit it, by adding at least 10 stitches? I would love this cardigan be large enough for plus size ladies.. The pink cardigan is beautiful! I have been looking for a sweater this color and have not had any luck. Your pattern is lovely, and I appreciate your sharing it. The last cardigan I made was for my baby 40 something years ago but I have kept knitting shawls, scarves, etc. I think, this cardigan is my favorite of all of your designs that I have seen and loved. Hope I can find the pink color on line or here in Tennessee. Thank you so much for your generosity. Hi Jessica! I ordered the kit from Lion Brand and I’m getting ready to start knitting! The pattern does not appear to say how many rows of 1 x 1 ribbing needs to be done. In looking at the photos it looks like I need to start with the ribbing and then move into the Rows 1 – 8 knit. My question is how many rows of 1 x 1 ribbing do I do? Hi Jacque! So glad you liked it enough to buy the kit! The only ribbing is actually on the sleeves. You start with the garter stitch on all the panels. Hope this helps! I absolutely love all of your patterns. I have made 3 of your kimono sweaters and they are so quick and easy to knit up. My daughter’s loved them. Here in Northwestern Ontario we are in a deep freeze, extreme cold warnings. Tonight we are expecting it to get down to -45 F with the find. I have a lot of wool on hand so I will be starting this sweater for sure. Thank you for all of your beautiful patterns I love love love them. Oh wow! Stay warm! So happy you like my patterns and thank you so much Anne Marie! Hi Jessica. I am a new subscriber to your newsletters. Thank you so much for your great patterns. I love your style. I just cast on this cardigan and am on my second front panel. I am wondering if I should decrease at the end of the row this time instead of the beginning again. I think that will give me a right and left side. Also is gauge right? I got 10 stitches for 4”. But I got 10 rows for 4”, not 5.5. I can easily adjust for length but I’m wondering if my knitting is really that tight! Hey Brooke! Thanks so much for following along and subscribing. So happy you like my patterns! The panels should be reversible, so you’re good decreasing where ever you’d like as long as the panels match! You may just have to knit for more rows if your gauge doesn’t quite match mine. I am a super loose knitter typically, so it’s possible. Sorry for the delay here! I made a “tester” cardigan out of the Lion Brand Pound of Love in a light gray.. I found out that I tend to loosen my gauge as I knit apparently so mine is huge! I’m going to figure out how to re-knit part of it (the arms!) but the Pound of Love was perfect because I made mine to be about mid-thigh length. Very affordable to try it out. I bought the kit in Teal so now I know that I need to size down when I make that one! And Lion Brand has super customer service. I somehow ended up with the kit in Cranberry at first by accident and when I contacted them, they told me to keep the Cranberry kit for free and sent the Teal kit to me as well! Hi Jessica! As always love everything you post and like everyone else I am so blessed by your beautiful patterns and pictures. I am not a huge cardi girl and was thinking of making this into a sweater. In my mind it’s totally doable but I’m a pretty new knitter and never knitted a sweater or cardi and was positive I never would. Thanks to you I don’t feel that way. My thoughts were making two back panels and having a go of knitting the sleeves in the round which I’m told is easy! I realize I’ll have to consider getting more yarn and where I live in Canada we just got in feels like butta at Michaels and it lives up to its name! It’s really hard to find yarn here where I live. We just moved and where I lived was the land flowing with much yarn at many sources. Now I’ve got Michaels and Wallmart. For you, my fellow Canadians I hear yarn Canada is a good place to shop online. Any suggestions Jessica would be great! Hi Amanda! I love your idea of making this into a sweater! I hope it works out well for you! As far as places to shop for yarn in Canada – I really don’t know! Being from the states, I’m lucky to have a lot of places to shop. But I have no clue what’s available in Canada. I hope maybe some readers might have some insight for you! Do you ever order yarn online? Hi: I love your cardigan. I chose color Ice. Love it. I may be overthinking this but I don’t understand the arm opening section. How do you cast off the last two stitches of this row? Would it be the first two of the next row? Hi. I love your pattern. I chose color Ice. It’s beautiful and the yarn feels so soft. I have a question about the instructions. To cast off forming the sleeves on the back panel. When you are at the end of the row do you complete this row and cast off the two for that end when you start next row. Hope I explained that. I can’t figure out the cast off ending the row and have my yarn in correct place. Do you have to hold 2 Strands of yarn together ? I am using Bernat Softee chunky and was just going to use 1 Strand . Please advise ?